In May 2010 the Ewing Halsell Foundation granted funds to the Harte Research Institute and River Systems Institute to devise a novel experiential, technology enhanced education program focused on water and watersheds, from the headwaters to the ocean. 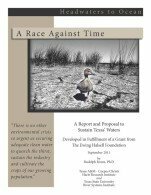 A project report and education improvement implementation proposal has been issued as a product of that grant to implement youth water education in South and Central Texas watersheds. This complements additional work funded by the Ewing Halsell grant now underway to establish high-tech headwaters to ocean water education discovery centers, one at the headwaters and one at the ocean. The report and proposal describe the logical next step in educating youth about water, covering elements of enhanced water education supported by the Ewing Halsell grant.